I love to be surprised and this is what happens when you have to buy DIY stuff at Bauhaus Lokstedt. 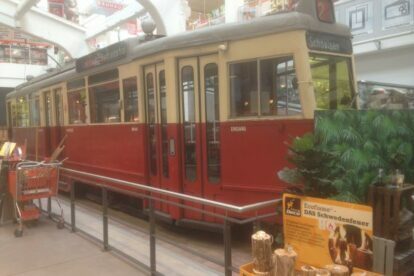 The shop was reconstructed in 2014 and now has an old tram. Why? Because at that particular place there was once the tram depot of Lokstedt, a former suburb of the city. The ceiling of the depot has been built into the shop so you can get a glimpse of how it used to look like there. Well, if you don’t get distracted by all the DIY stuff around you. Sometimes you can even enter the tram, but in any case it is an interesting and surprising thing to see this old vehicle there. And if you need new batteries or a tent or anything else related to DIY, it is pretty cool to get it there.